Pioneer Woman 1.5 Quart Slow Cooker (Set of 2) Fiona Floral/Vintage Floral | Model# 33016 by Hamilton Beach for $19.99 !!! reg price $45 !!! Awesome Deal !!!!! 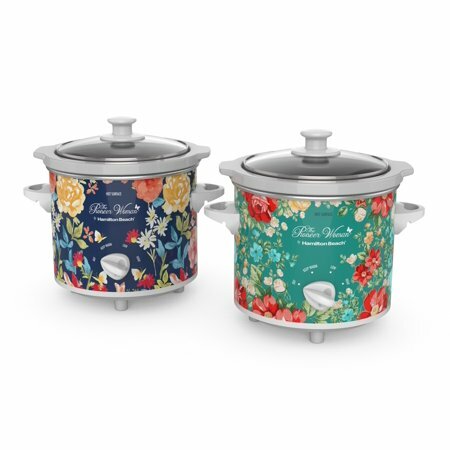 Hurry to scoop up this , Pioneer Woman 1.5 Quart Slow Cooker (Set of 2) Fiona Floral/Vintage Floral | Model# 33016 by Hamilton Beach for $19.99 !!! reg price $45 !!! Summer Infant Deluxe Baby Bather is just $10.99 !!!! reg price $16 !!! Huge Double Sleeping Bag 23F/-5C 2 Person Camping Hiking 86″x60″ W/2 Pillows New- for $39.95 + FREE shipping !! reg price $100! Gain Fabric Softner , only $.97 each at Walmart!! Cute Cousins Tees for as low as $8.99!!! reg price $22 !!! Pioneer Woman Hand Mixer with Vintage Floral Snap-On Case by Hamilton Beach thats $14.99 !!! reg price $30 !! !